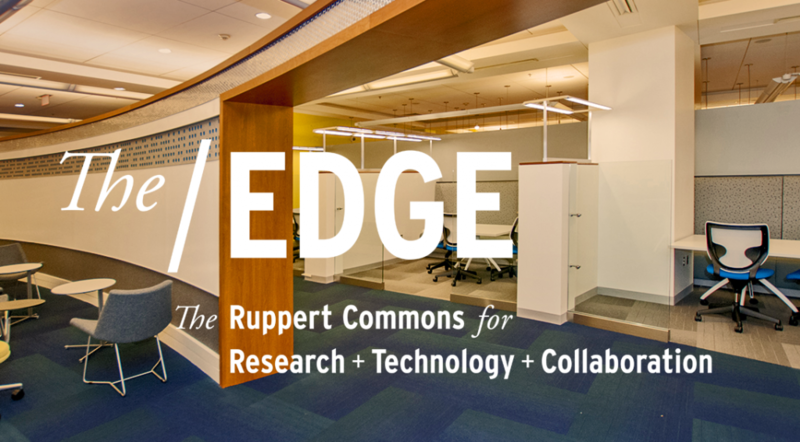 The Ruppert Commons for Research, Technology and Collaboration, also known as The Edge, will be our primary space. We will reserve key rooms and project spaces for students to collaborate. The Hackathon orientation and home base will be there. Our home base will be where we address the teams as a group, serve snacks and drinks, and gather occasionally for questions, comments, and final remarks. From the Edge, we will lead occasional tours to other parts of the library for training in various research focal points (e.g., microfilm machines in Bostock and archival collections in Rubenstein). The Ruppert Commons for Research, Technology and Collaboration extends Duke University Libraries’ mission by providing a collaborative space for interdisciplinary, data-driven, digitally reliant or team-based research. Located on the renovated first floor of Bostock Library, the Edge brings together resources and expertise to help Duke researchers innovate, in a space that invites discovery, experimenting, and collaboration. Generous funding to create the Edge was made possible through the Duke Forward Campaign. The HistoryHackathon is intended to celebrate the opening of Rubenstein Library’s new space. Thus, we hope to lead at least one, but preferably two sessions to the archive to get a brief orientation on how to use the collections, best practices, and document handling instructions. The David M. Rubenstein Rare Book & Manuscript Library is a place of exploration and discovery. For more than 100 hundred years, scholars have used these deep collections to write new histories, explore significant lives, study ecological change, trace the evolution of texts, understand cultural shifts and create new art and literature. On August 24th, the Rubenstein Library will reopen after its nearly three-year renovation. The renovation will increase the research, instruction, storage, and exhibition capabilities of the Rubenstein Library. It also addresses the need for state-of-the-art stacks with high-tech security and a closely-monitored environment. A new special collections reading room accommodates more people than the current space, and offers researchers more elbow-room per person. There are designated spaces for collaborative research.